Greetings, Beloveds. I AM Lady Nada and I come forth into your consciousness, illuminating your Pure Love Essence that is at your core. I reflect and illuminate this immense potential you have to allow Divine Love to be at the core of everything you do, say and think. As you expand your Beingness, as you accept the pure LoveLight that catalyzes and sparks your pure crystalline nature, and as your energy unleashes all the potential you have in your DNA, you awaken to more Beauty, and Joy and Grace than you have ever thought possible. Nestle now into this Flow of Divine Love that washes over and through you, beloveds, for it is the keeper of your Soul, the purpose of your Being, and the color of your Being within … and actions without … and is awash with such Grace and Purity as you revel in and nestle down into this Pure Love Essence that is at the core of you. It IS YOU, beloveds. You know this, and you are accepting the deep fathoms of its meaning and presence, in a deeper way as you allow your True Self to emerge … as you allow your Divine Self to emerge … and take over your very existence, as you let go of each belief and mindset that impedes your knowing that Love is All There is. Love is Everything. Love is your Totality. Love would Understand with Compassion, would it not, all that you once rejected? Love would Accept, would it not, all that presents within your sphere of Being, to be with it in neutrality and quiet stillness, until Peace ensues? Love would Know, would it not, that nothing is incapable of being forgiven, that nothing is ever forsaken, that all is part of your growth and evolution? Love would be honored to BE all that you Are in this moment and would know that you are whole and complete and perfect just as you are, ever evolving into deeper Love and Purity with each breath you take of the LoveLight available for your taking. And Love would Know that ALL IS LOVE, for there is nothing else under the Sun that cannot be transformed in LoveLight to Pure Love Essence that is always at your core — nothing so negative, nothing so contradictory, nothing so extreme, nothing so uncomfortable, and nothing so unclear — for bathed in the light of Love, All is transformed, and Peace ensues. So Beloveds, embrace the Pure Divine Love at your core, embrace it more each minute of every day, and converse with it and envelop it, for it is the motivator of your Soul, and the answer to everything under the Sun. Donations are always lovingly welcomed, Here. 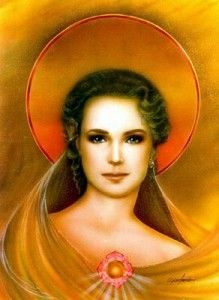 This entry was posted in Ascended Masters Messages, Audio Recordings of Messages, Fran's Channeled Messages, Lady Nada and tagged Ascension process, Beauty, Divine Love, Divine Self, Fran Zepeda, Joy and Grace, Lady Nada, Peace, Pure Love Essence, Purity. Bookmark the permalink.